Luggage loops are fun and can be used for more than attaching your identification to your luggage. Consider using them on school projects, containers at bake sales, electronic devices, and garment bags. There is a giant offering of colors if color coordination is a goal. You can have them in green, blue, clear, black, white, red, and black translucent plastic. Also consider a Fellowes or a GBC heat-seal luggage loop. All products are covered by our satisfaction guaranteed and are affordable. Order yours today. Help detect and categorize all your suitcase, briefcase, carry-on, luggage or any other belongings that you don't want to lose. Transcript: Here we are going to show you how to use small plastic loops, also known as luggage loops, to attach a luggage tag to your…luggage. First insert the loop into the tag slot. Then bring one side of the loop through the other and pull it together. Now to apply it to your bag, bring the loop under the strap, and bring it over the tag to insert your tag through the loop. Pull it tight and adjust it nicely and you’re done. 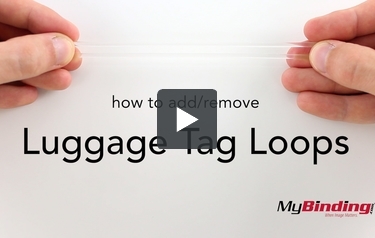 Here we are going to show you how to use small plastic loops, also known as luggage loops, to attach a luggage tag to your…luggage. Now to remove it, pull the end of the loop attached to the strap, loosening it, and slide the tag out from between the loop.